If you’re ever trying to make up your mind between two equally appealing financial options, you probably have a few dependable resources to turn to: you could consult with your loved ones for advice, you could ask a mentor for insight, or, if you’re feeling really split (and totally whimsical), you could always flip a coin. But if none of these options provides the clarity you seek, you might want to try taking a step back and assessing your options in a more objective light. Say you’re an HR manager, and you’re trying to pick between two job offers: one is at a large international corporation, where you stand to earn $90,000 a year but might not feel completely fulfilled by the work; and the other is in the non-profit sector, at a company whose mission appeals directly to your skillset and passions, but where your annual salary will only be $60,000. Naturally, it’s hard to pick which of the two options is right for you – does it make sense to take more money if the job is less gratifying? If you can’t come to a clear conclusion, you can determine your opportunity cost by using a very simple formula: divide what you’ll sacrifice by what you stand to gain if you take one job over the other. So, in this instance, if you’re seriously considering the lesser-paying position at the non-profit, you’ll find that $90,000 (what’s lost) / $60,000 (what’s gained) = $1.50. This gives you, in plain terms, the opportunity cost of taking the less lucrative position–for every dollar you’d make at the non-profit job, you could have been earning $1.50 at the other job instead. Once you’ve calculated your opportunity cost, consider that figure and stop here – maybe that $1.50 gives you everything you need to know. If, on the other hand, you’re still uncertain, you can still go on to conduct a more detailed cost/benefit analysis. In the case of the HR manager, the question is whether the sense of fulfillment to be gained from the non-profit job outweighs the 50 cents (or 50%) in wages that you’d be sacrificing. Fulfillment is obviously much harder to quantify than wages, but you can still find creative ways to conduct a cost/benefit analysis. For instance, you could ask yourself to quantify how happy either job would make you, on a scale of 1 to 10. If you give the better-paying job a 7/10 and the non-profit job a 9/10, you can then calculate the “fulfillment opportunity cost” of taking the non-profit job by dividing 7 (what you’ll sacrifice) over 9 (what you stand to gain), giving you an answer of .78. We now know that for every unit of fulfillment you’ll gain at the non-profit job, you could be gaining .78 units at the other job. This leaves us with two numbers: $1.50 (the financial opportunity cost) and .78 (the fulfillment opportunity cost). Assuming that money and workplace fulfillment are equally important to you, you’ll want to directly evaluate those two numbers by multiplying them together. This will create a composite opportunity cost by merging your financial and fulfillment opportunity costs into one measurement. Based on whether your final answer is less than or greater than 1, your calculations will tell you if the opportunity costs outweigh the benefits or vice versa: in this case, 1.50 x .78 = 1.18. Because it’s greater than 1, this number tells the HR manager that the composite opportunity cost is too great to make the non-profit job worthwhile–in other words, the amount of money they stand to lose outweighs the fulfillment they’d gain. According to this calculation, then, the HR manager would be better off taking the job at the larger corporation. It’s impossible to make meaningful life decisions just by using a simple formula, but opportunity cost and cost/benefit analyses can both be used as valuable tools in a broader decision-making process. 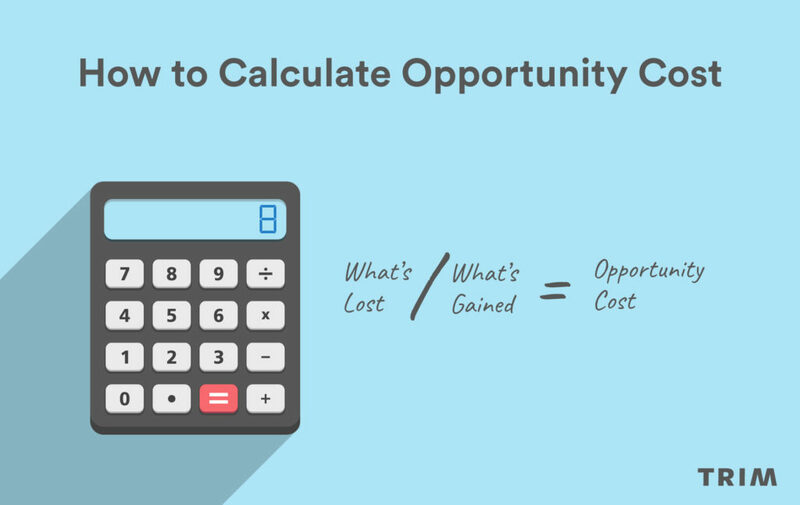 Whenever you’re struggling with a tough dilemma, you can use the basic formula of What’s Lost / What’s Gained = Opportunity Cost to personally weigh the pros and cons in simple, mathematical terms. And if you’re looking to apply these concepts to other parts of your financial life, alternative formulas for opportunity cost and cost/benefit analysis are being used every day to help people make more educated investments, too. For More Help with Saving Money, Sign up for Trim!